We'll assure you the lowest price on the web, when you order your ¼ oz 2017 South Korean Tiger gold round from our online store today. This exquisite series saw inception in 2016 and features immaculate artistic renderings of one of the world's most endangered big cat species, the Korean or Siberian Tiger. Sadly, the bamboo forests of Korea are no longer home to this majestic predator, as the last Korean Tiger was hunted there in 1922; only 400 of the species remain, in the far eastern parts of Russia and Siberia. Remember the Korean Tiger in his prime and diversify your holdings with a ¼ oz 2017 South Korean Tiger gold round today. Voorzijde A close up of a tiger roaring, as well as the year, title, and troy ounce weight of the round. Achterzijde Letters of the Korean alphabet, arranged in the shape of the Korean map. 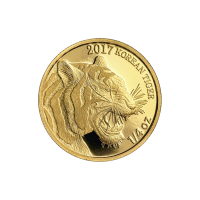 1/4 oz 2017 South Korean Tiger Gold Round We'll assure you the lowest price on the web, when you order your ¼ oz 2017 South Korean Tiger gold round from our online store today. This exquisite series saw inception in 2016 and features immaculate artistic renderings of one of the world's most endangered big cat species, the Korean or Siberian Tiger. The coin's obverse features a marvellously detailed rendering of a Korean Tiger roaring. Also included on the obverse, the weight, date of issue and 'Korean Tiger' title. On the reverse of the coin is a typographical relief, made of letters of the Korean alphabet, arranged in the shape of the Korean map. The map is flanked by KOMSCO's latent security feature and Korea's national emblem, while the Korean legend and the coin's metal content and 9999 purity appear within the wide border on the reverse side, which is decorated with a design of tiger stripes. Sadly, the bamboo forests of Korea are no longer home to this majestic predator, as the last Korean Tiger was hunted there in 1922; only 400 of the species remain, in the far eastern parts of Russia and Siberia. Remember the Korean Tiger in his prime and diversify your holdings with a ¼ oz 2017 South Korean Tiger gold round today.